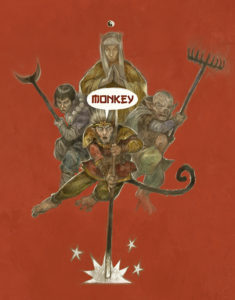 One of the big drivers for doing the 2nd Incarnation of Monkey was a clean up and streamline the rules. Not that the rules were by any means awful, but there was certain areas where they could do better. 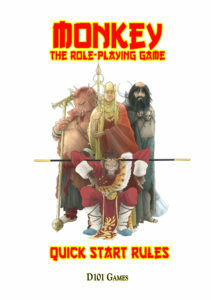 Also they where very much of the early 2000s School of Narratist gaming and by now even the games that where part of that movement (HeroQuest, FATE spring to mind) have undergone changes to make them more accessible and easy to play. Just look at FATE Core or HeroQuest Glorantha and you’ll see where I’m coming from here. Play one Card. If you want to upgrade to Monkey 2 the quickest change you make is you now only play one card out of all the cards you draw from various sources. This makes the game much more manageable, no more large spreads of Action Hands cluttering up the table and no more fiddly maths adding up the totals of cards. Fortune and Virtue are now gone and have been replaced by Te. This is a chinese term that represents Personal Power and Virtue, This allows more experienced characters to draw extra cards and take control of the narrative via Stealing the Scene, like fortune did before, and is a measure of how in tune with the Universe they are. More supportive frameworks for creating Scenes and Non-Player Characters, so that the Narrator can improvise and fill in the gaps in their adventure plan at a moments notice without breaking a beat. Mook rules! Take down hordes of nameless demon extras with a round house kick or get overwhelmed as they mob you! !